A delicate, fragrance free blend of pure plant oils. Rich in essential fatty acids and antioxidants which help strengthen the weakened skin barrier of sensitive skin. Discover the peace and comfort nature brings to the most sensitive skin. Creating certified natural skincare for sensitive skin requires great expertise, bringing together delicate blends of pure plant oils and extracts, carefully selected for their calming and soothing properties which help to reduce inflammation and strengthen the weakened skin barrier. With antioxidant-rich maqui berry, soothing botanical complex SyriCalm® and Omega-7-rich sea buckthorn, Trilogy Sensitive is certified natural, fragrance free and dermatologically tested gentle skincare that brings peace and comfort to even the most fragile, intolerant and easily irritated complexions. Your skin will love you for it. Prunus armeniaca (apricot) kernal oil, Prunus amygdalus dulcis (sweet almond) oil, Aristotella chilensis (maqui berry) seed oil, Hippophae rhamnoides (sea buckthorn) oil. Gently massage 2-3 drops into face, neck and décolletage after cleansing then moisturise as required. Do not use on broken skin. 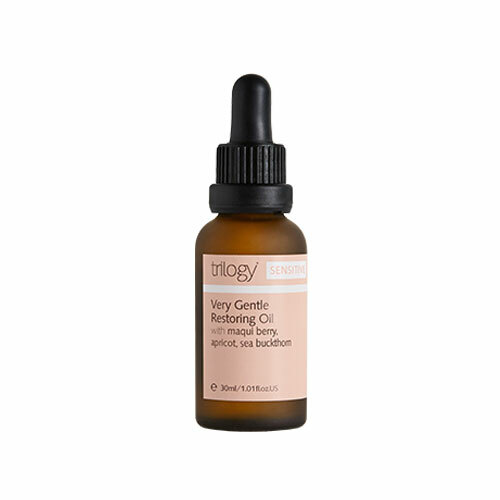 Below are reviews of Trilogy Very Gentle Restoring Oil - 30ml by bodykind customers. If you have tried this product we'd love to hear what you think so please leave a review.